The 2017 Kawasaki Ninja 650 is a mid-range sports bike and is powered by a 649cc parallel twin engine which puts out 67bhp. It can be restricted for the A2 licence and is closely related to the Z650 naked bike. The faired version of the new Z650 is powered by a Euro 4 compliant water cooled 649cc parallel twin four stroke engine, producing 67.3bhp at 8,000rpm and maximum torque at 6,500rpm. RRP is £6,350, £6,550 for the KRT edition, £6,950 for the Tourer and £7,300 for the Performance edition. Kawasaki are proud of the Steel trellis frame which only weighs 15kg and light swingarm. The tachometer needle tip flashes red with the gear change indicator and unlike many of the massive recent Euro 4 silencers the Ninja 650's sits neatly under the bike for a great look. The 5-spoke cast Aluminium 17" wheels take a 120/70 Dunlop Sportmax tyre at the front and 160/60 at the rear. Accessories include a 30 litre top box (£59) and bracket (£110), 14 litre panniers (£265) and bracket (£96), Akrapovic Titanium exhaust system (£1,030), pillion seat cover (£158) and frame sliders (£211). Note that Kawasaki says you cannot combine the topbox with the pannier set. 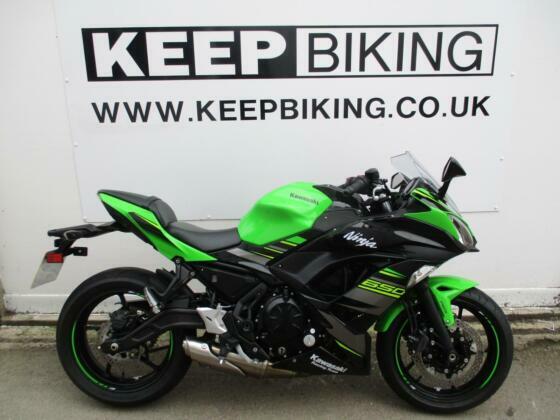 The Ninja 650 KRT special edition gets you a green/black paint scheme with graphics, pillion seat cover and wheel decals. The Tourer edition gets you soft panniers, high screen, engine guards, kneepads and a gel tank pad. The top Performance edition gets you an Akrapovic silencer, smoked screen and colour coded pillion cover. 2018: KRT edition gets a new lime green colour scheme.